Abbeydale: A Piece of Calgary for You? By now you've heard of Abbeydale. Find the yellow number 101 on the map below. It's in the city's far east between 68 Street and Stoney Trail, the CNR tracks and the Trans Canada Highway, 16th Avenue NE. About 6000 people live out here and this community boasts a lower rate of crime than most of the surrounding areas. 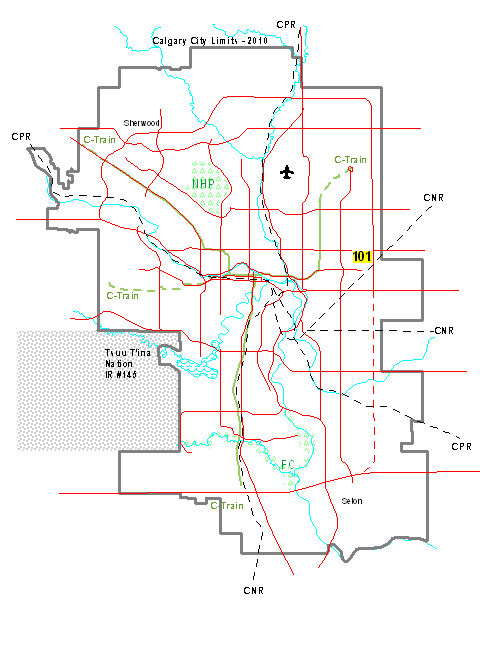 The City of Calgary added the land used for the development of this area in 1976 and development occurred throughout the 1980's. This makes it one of the more modern areas on the east side. It's a great commute to most anywhere in the city if you drive. You have free flow traffic on Highway #1 east and westbound and Stoney Trail north and southbound right there. It seems this is a great place for young families. The real estate is quite affordable and they have set things up for kids. The Community Association here has a lot of kids programs. Day care, sports, dances, family skating outside, a BBQ, tennis and Scouts, to name a few. For those who are a bit older, they have darts, pool tables, pub nights and dinners. It is designed to fit the needs of those in the area. There is also plenty of entertainment along 52nd and 68th Streets. This neighbourhood has quiet, clean, friendly streets, parks and outdoor sports. There are also cul-de-sacs, some shopping close at hand, easy access to major roads, like the Ring Road (the Stoney Trail mentioned above), playgrounds, transit service. Children in kindergarten to grade 6 attend the Abbeydale School, junior high students go to Dr. Gladys M. Egbert School right next door the west in Marlborough Park and senior highs head off to Forest Lawn High School, which is at 44th Street and 8th Avenue NE. For families who belong to the Catholic system, Holy Redeemer and Blessed Kateri Tekakwitha schools take kindergarten to grade 6 children while St. Martha has kindergarten to grade 9. High school students go to Father Lacombe High School over on 36th Street. Those who choose to worship close to home have the Eastside City Church conveniently located right at the end of Memorial Drive. Go back to the Calgary Real Estate web page, or visit the Calgary City maps homepage.